Get notified when Fish in the Dark tickets are available! Celebrated comedian Larry David is known as the creator of the television shows “Seinfeld” and “Curb Your Enthusiasm.” Now, he’s bringing his hilarious brand of comedy to the stage with “Fish in the Dark.” A comedy that examines how 15 characters cope with death, the show premiered on March 5, 2015 at the Cort Theater on Broadway and has earned rave reviews from critics. 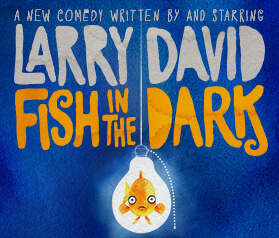 Whether you want to head to Broadway to see the show or see a performance of a tour production in your hometown, you can use the links above to buy Fish in the Dark tickets online.